If you follow my blog instead of stumbling upon today's post by accident, you know that I am repainting big old pastels from 2005. This one is River's Edge. I painted a small study of it yesterday and changed it quite a bit from the way I looked at things ten years ago. 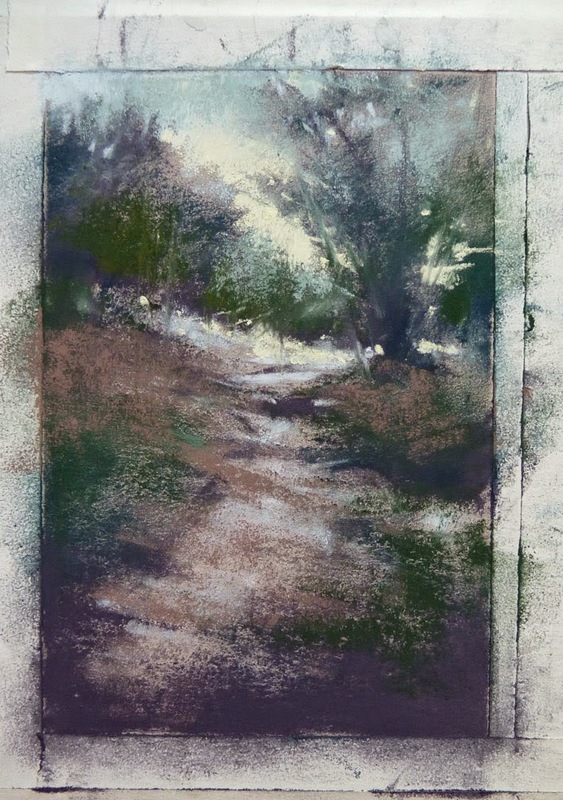 I decided to unframe the painting and use the paper (Wallis Belgium Mist) for a new scene using two small studies I did for a larger version of Dappled Path. 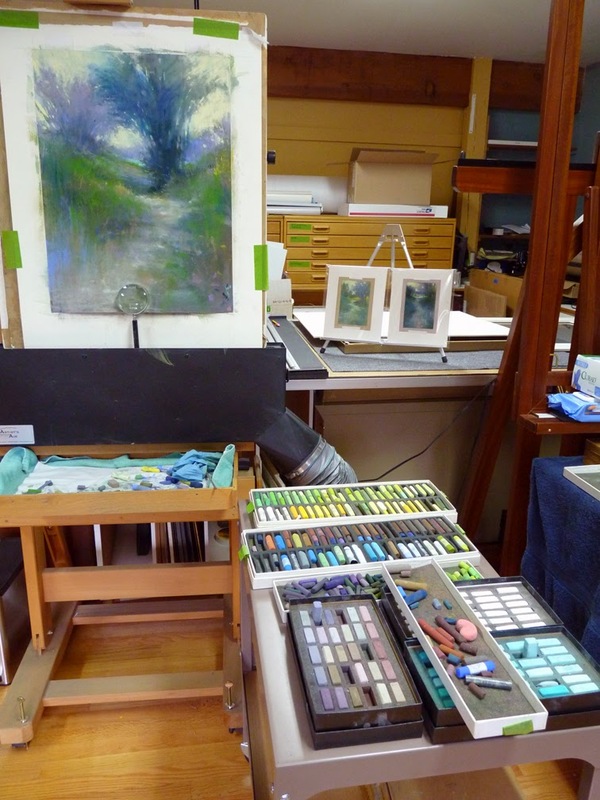 After I brushed and vacuumed off as much pastel as I could from the original painting, I applied acrylic with a 2 inch house painting brush using the small studies as a loose reference for the composition. This is the new painting about 70% complete. Notice my very limited number of pastels - an added challenge. These are the only ones that are not packed up for the move. 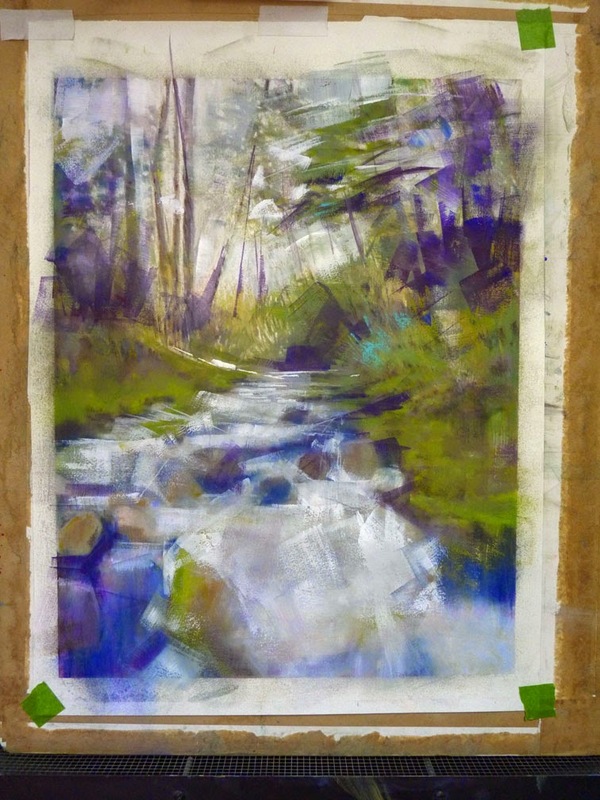 I unframed my old painting, A Boulder View, and was surprised to find the surface is Lanaquarelle 140 lb watercolor paper with a pumice gel coating for pastel work. 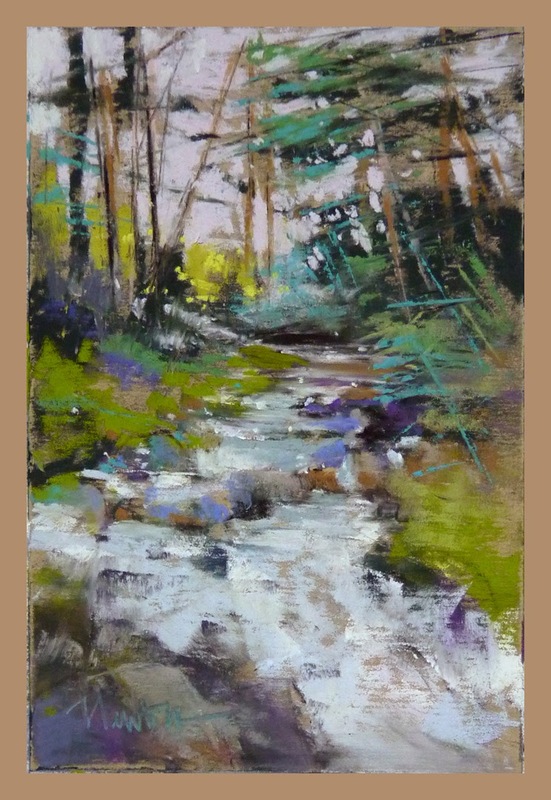 Not much tooth left after I brushed the pastel off so I used acrylic to block in the new painting, Spring Stream. 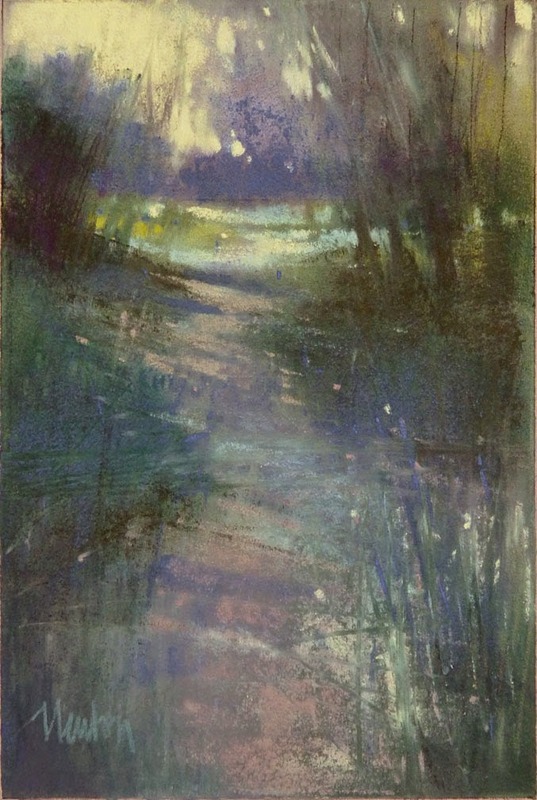 Pastel was added to most areas but not all so this is a mixed media piece. Ta-duh! Done. 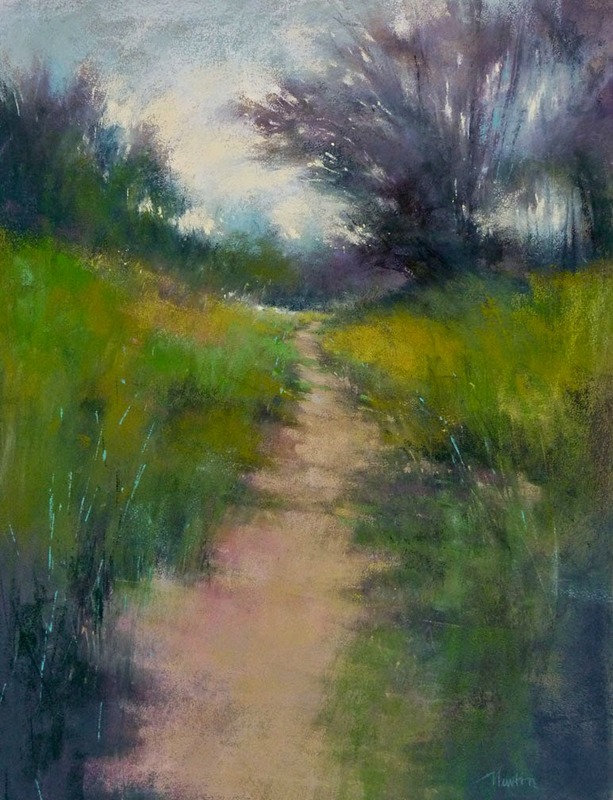 I'm very pleased with the large version re-painting of Dappled Path. It has been renamed Course of Events. The six small studies were extremely helpful! I ended up using the first one as my reference (shown below). The loose and spontaneous feeling of the small study is difficult to capture in a large format primarily because I am working with a small piece of pastel. 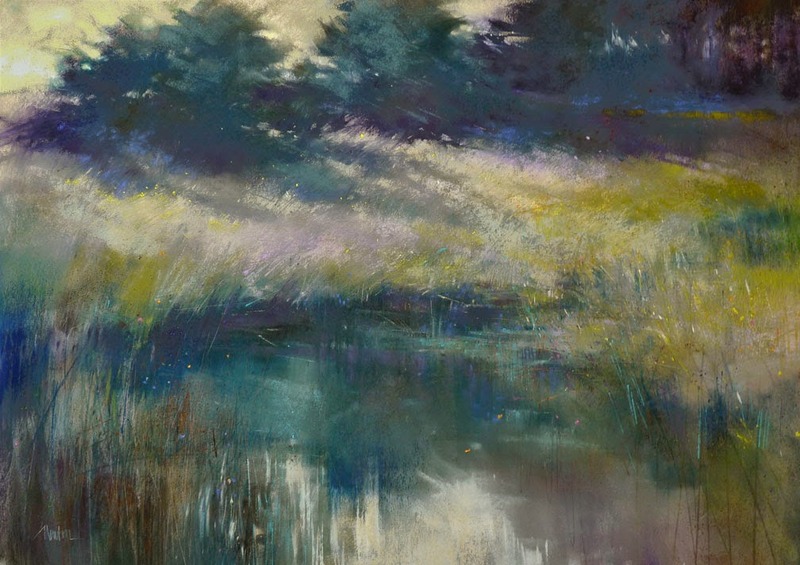 On a small study, one lively stroke of the pastel stick might cover 10% of the total area giving a nice swath of color. On a 24 x 18 format, the coverage is so much less that it makes me feel like I'm working with the point of a pencil. Now I see why those gigantic pastel sticks were invented and I might have to invest in some. These small studies have received a very warm welcome; my thanks to the three collectors who have given Study #7, #6 and #5 a new home. I have two more to post on Daily Paintworks for sale. I will keep the one above and plan to frame it in a 7x5 inch frame directly against the glass. No mat but the border of the paper will show. Added Note: A known French method of framing pastels is with the pastel directly against the glass. I have used this method for my own collection and find it works great as long as there is no movement - everything in the frame has to be stationary. 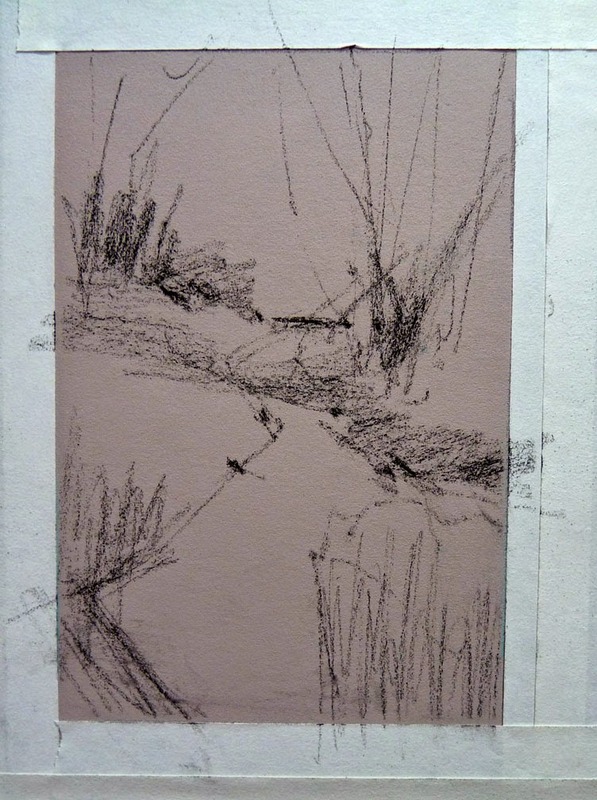 I mentioned that I would frame my small study in this method - both because it is small and because it is mine. Try it on one of your own works and see what you think. Note: this applies to UNMATTED work. 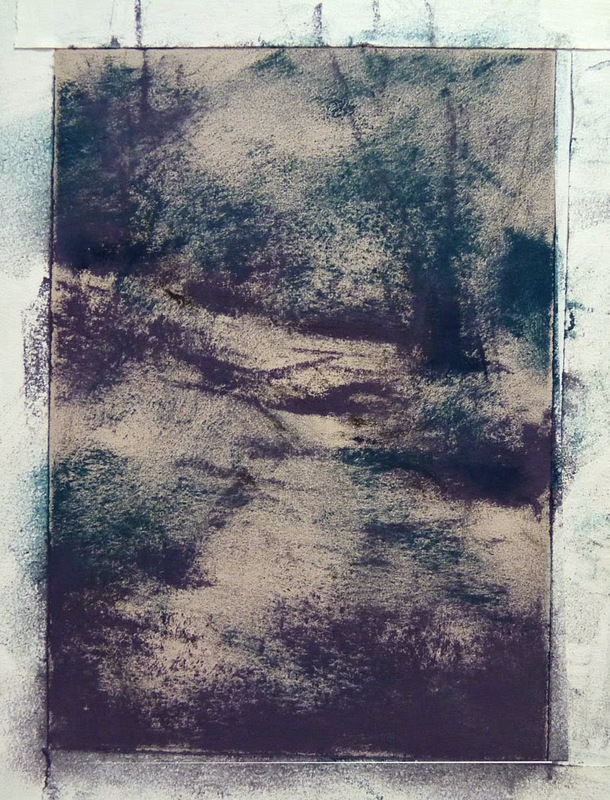 Don’t put a mat directly against a pastel - you will have a dirty mat. 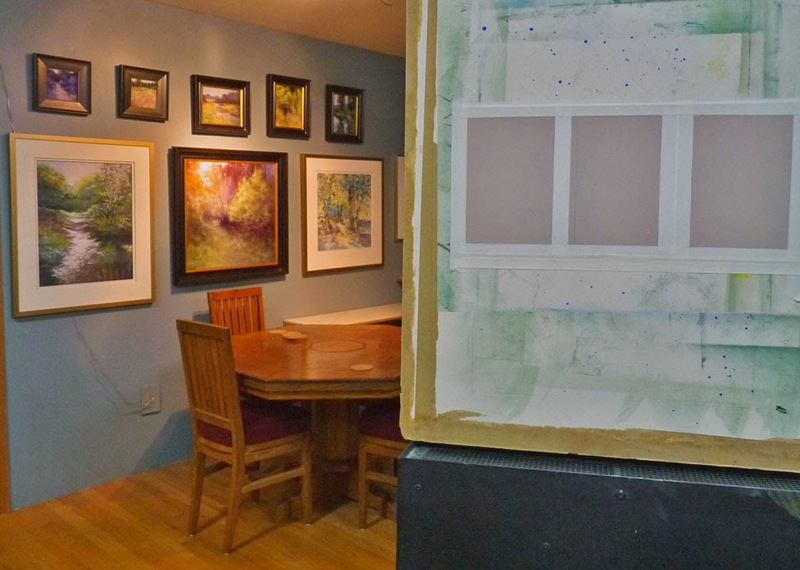 Presently, all my gallery work in pastel is framed with spacers behind the mat or, if there is no mat, there are spacers inside the frame to hold the glass away from the painting. Ten years ago my husband and I went on a photo shoot. 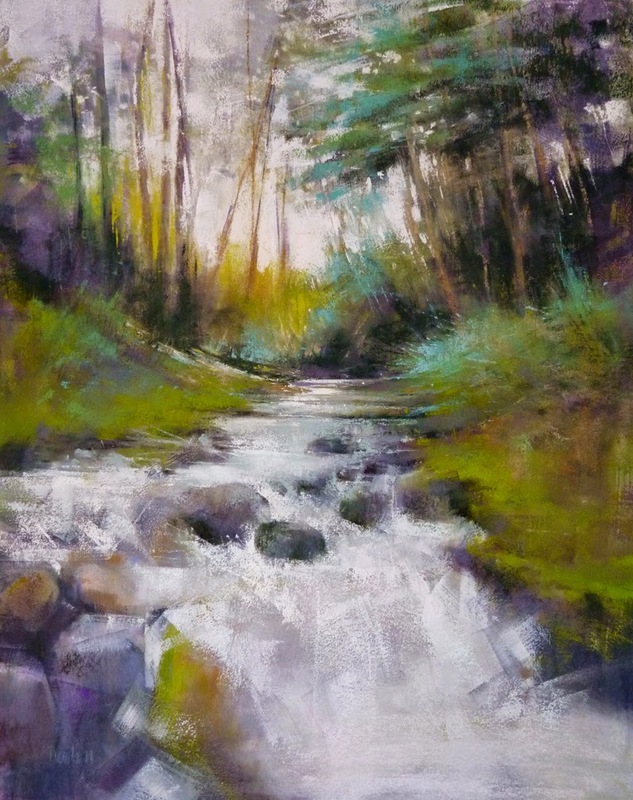 It was his first time capturing scenes for me to paint and he became so enamored of a stream rushing over rocks that he stood in the middle of the stream to get a shot for a painting he called "A Boulder View." At the time, I painted it mostly for him but today I will use it as reference to paint the scene again, without the huge boulder in the foreground. Painting a small study first works well for me. 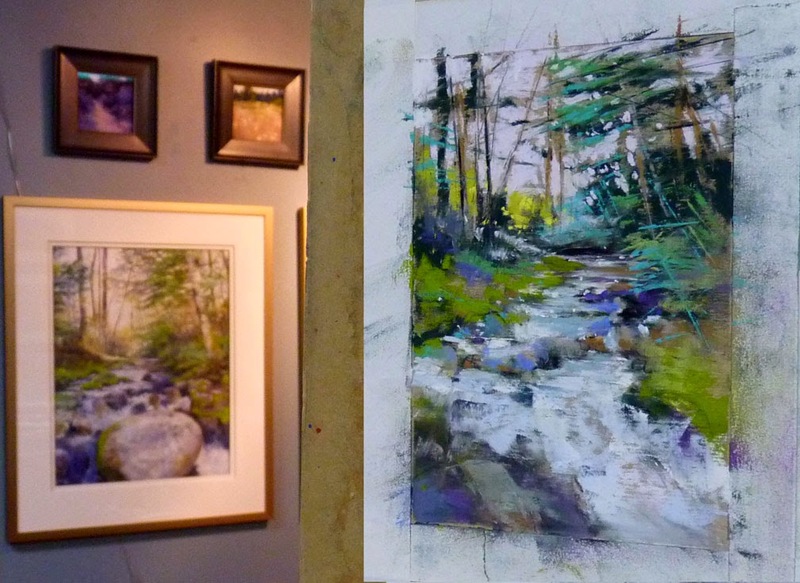 Here is a photo of the 6x4 study on my easel with the big painting in the background. 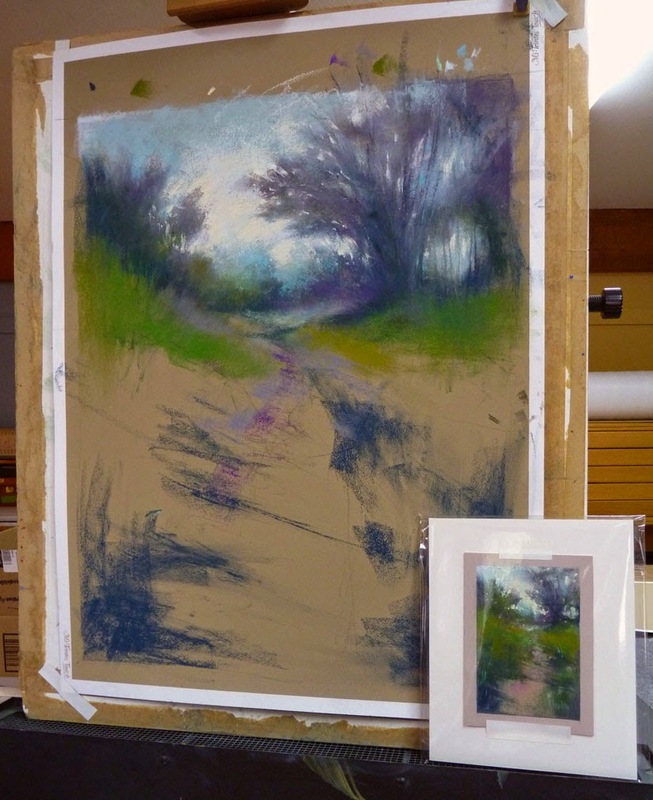 The Canson Mi-Tientes Touch paper I ordered for the large version of Dappled Path has arrived. I'm not familiar with it and this is a good experiment. My first impression of this paper is that it reminds me of LaCarte but with a coarser tooth. Linear marks are fat - I don't like that but it might keep me from getting too detailed. 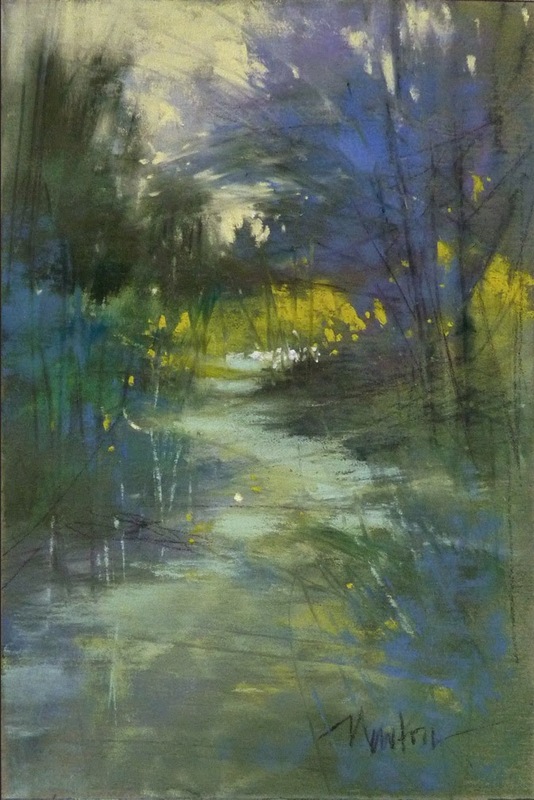 This painting is 25 x 18 inches and it feels like I can't see the forest for the trees. I'm looking through a reducing glass to get enough distance to see what I'm painting. 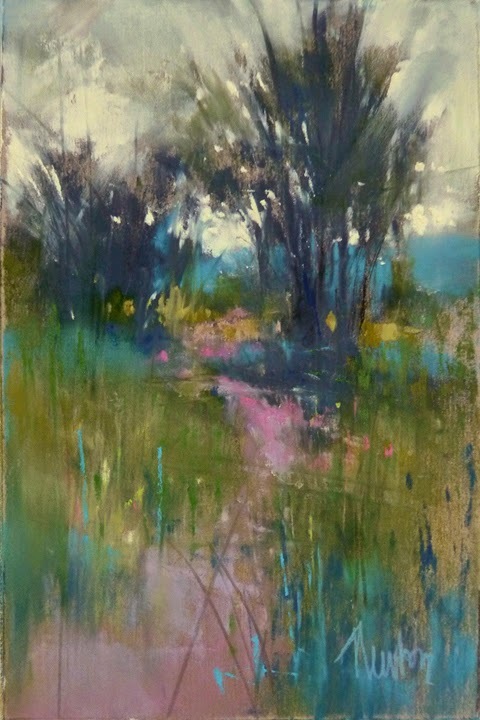 It is a struggle to get the loose look I want with a little pastel stick. I may have to try this again in oil or acrylic. Of the six small studies I painted in preparation for this painting, I have selected the first one for my reference and I'm starting at the top. 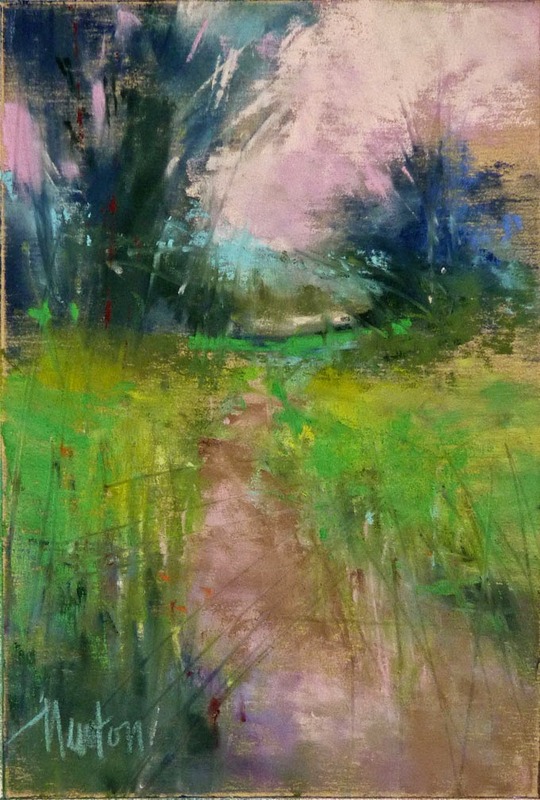 The studies will be going to Daily Paintworks for auction or Buy It Now. If you are interested in purchasing one before I post them at Daily Paintworks, let me know. It's a sunny day today! Guess it shows in today's study. I didn't even turn on the overhead Otts lamp attached to my easel. Love this bright morning studio...my new studio will not get the morning sun. Another study on Ersta 500. 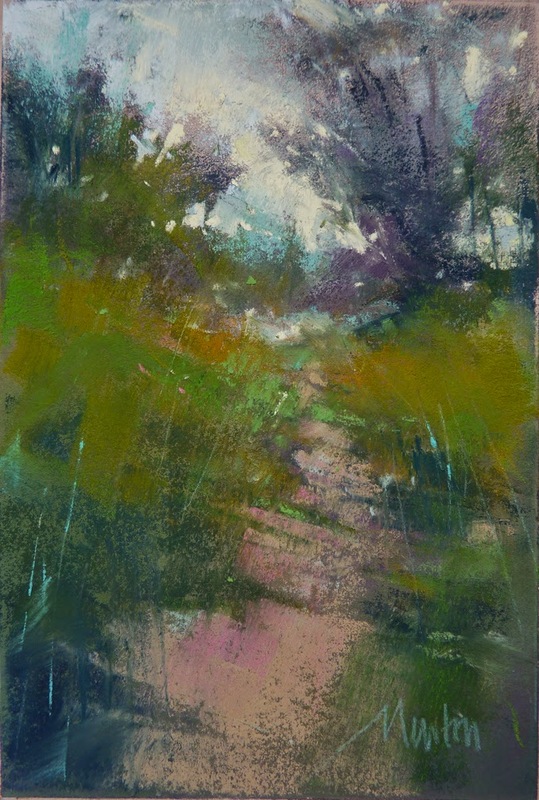 Dappled Path 4, pastel, 6x4 inches. Study for a larger painting. 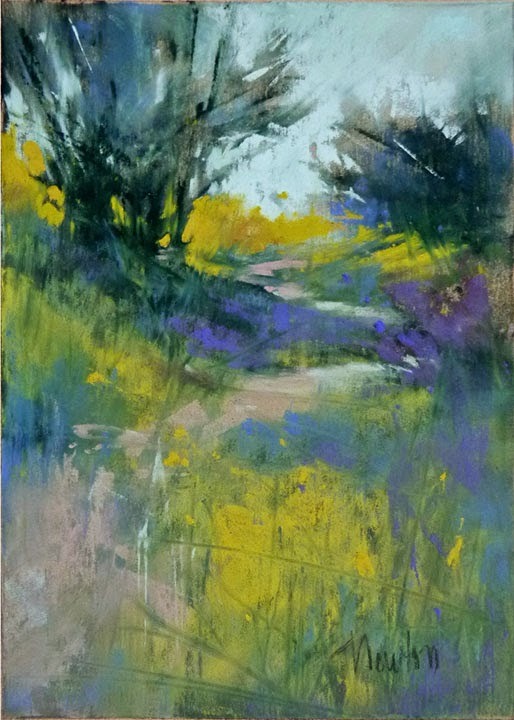 Another version of Dappled Path. - repainting this scene may become my Life's Work. In my last post I mentioned a new challenge I invented for myself: to paint a color study based on an old painting but with a new interpretation of strokes. It didn't work as planned but I am very happy with the new painting, shown at the end of this post. 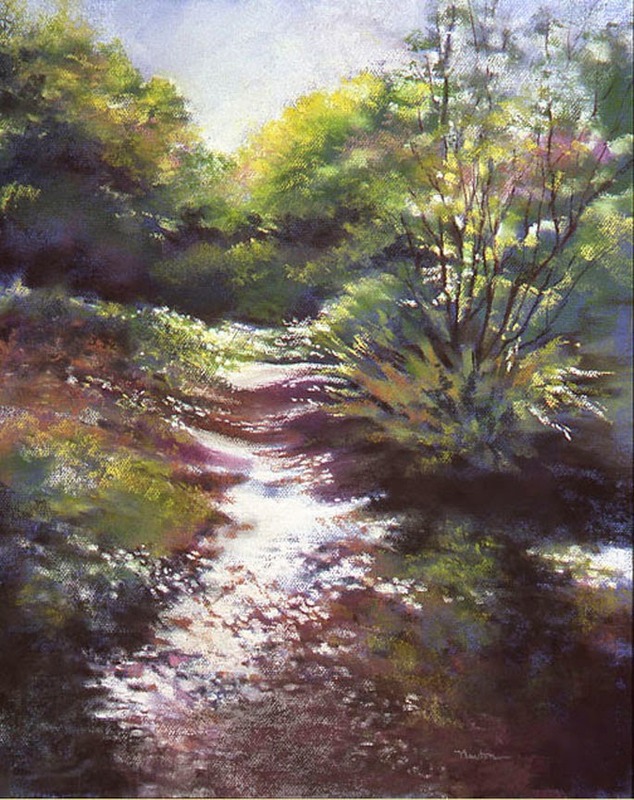 I used the original Dappled Path, painted 10 years ago, as my reference. Many of the same colors were used but in different amounts. The paper makes a big difference - the original was painted on Canson Mi-Teintes and then, I used the texture to tell the story. This time I used Colourfix. I really did TRY to stay with the original composition but the creative process took over. See the progression below. Step Three - and from here it took on a life of its own. 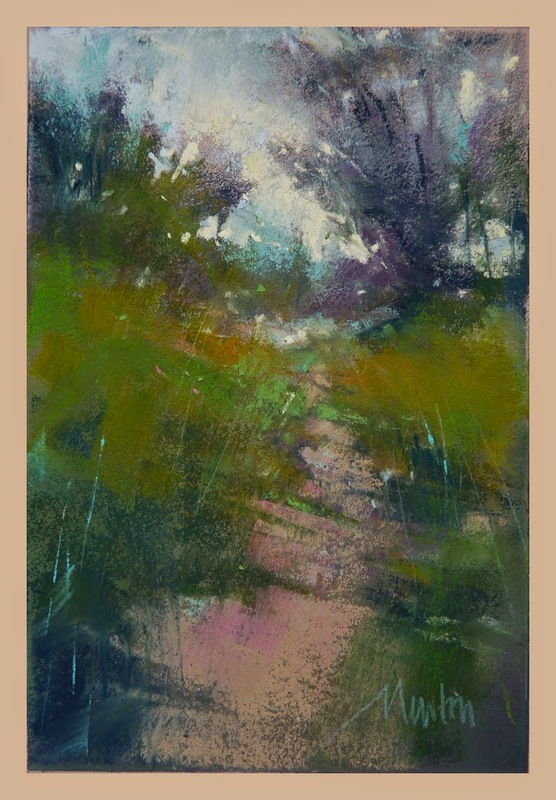 My next challenge is to paint Dappled Path II 23 x 18 inches, unframe the original and use the frame, mat and glass for the new painting. Packing up for the move. 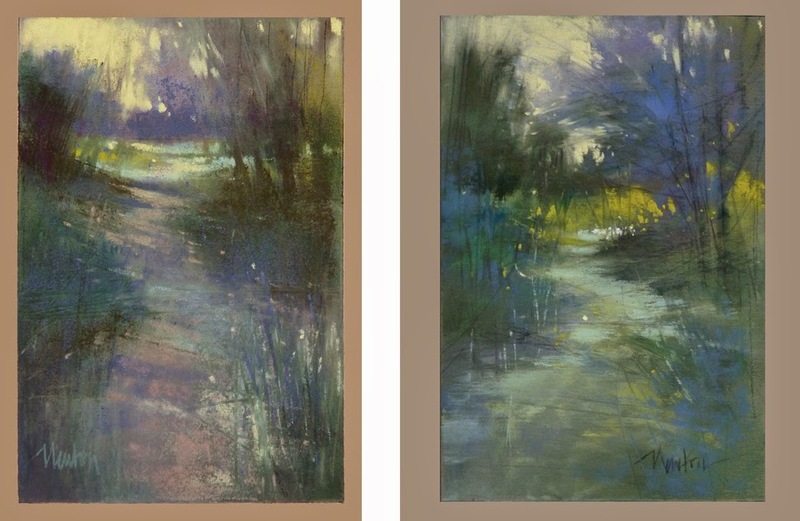 The pastels that have been beside my easel have been in two large Dakota pastel boxes. They are mostly Schmincke, Unison and Sennelier. Also, a half dozen boxes of Terry Ludwig and two chests full of NuPastels (a generous gift years ago from Cathy Woo). For the move I'm using the little foam cradles that came with my boxes. If you click on the photo above, you'll see them at the far end. When I married Jay 27 years ago he built a detached garage so I could have the attached garage for my Studio. 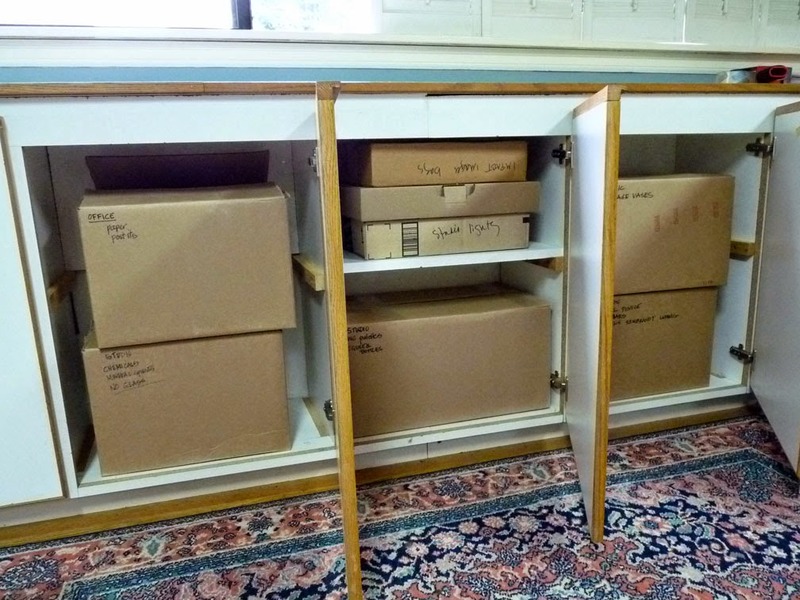 Jay and my father made a wonderful studio for me including a ton of under-counter storage. I have been packing up art supplies and my storage areas are full again. My studio has been rearranged (again) in a way that gives me a wall to hang the larger work that won't fit in the storage area under my counter. The large painting on the left in the photo above is still pleasing to me overall and in fact, has some very nice areas but some not so nice too. 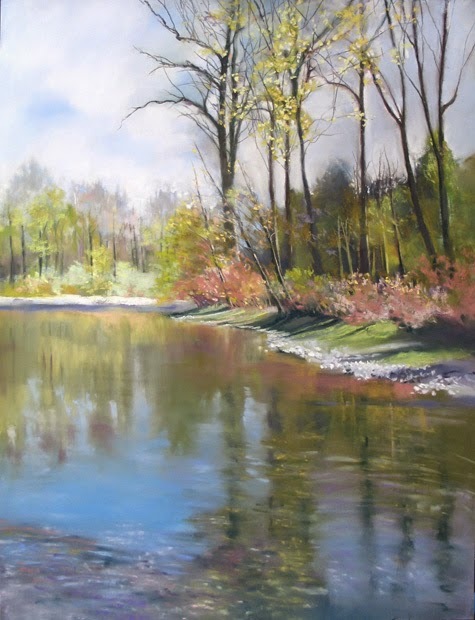 As I became more skillful in working with pastel, my strokes matured and I am imagining this scene as I would paint it today. In preparation for doing that, I'm going to start with a small color study of the painting. Then, from the small study, I'll paint the scene again in large format. Actually, I can think of quite a few old paintings I'd like to try this with. I'll let you know how it works! I am so excited to move to my new studio that will have new track lighting. 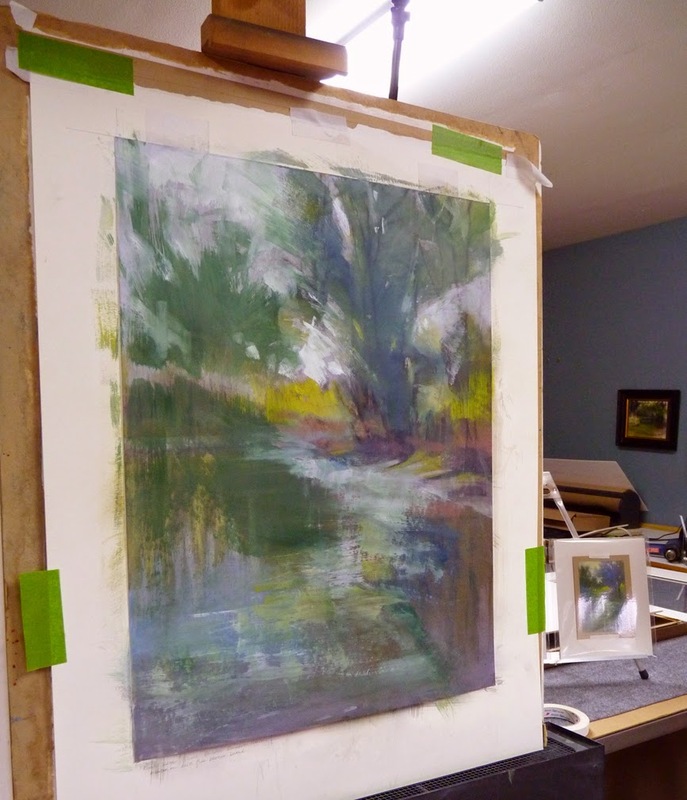 Paintings are one color on the easel, another color under overall studio lights then another color as I move to the window. I'm done thinking about it. I put it in a frame to keep it safe (from me). Click on image to enlarge for detail.